With the occurrence of another iPhone event and product launch on September 12, many users enrolled into Apple's program will be intending to pick up the latest devices as soon after launch as possible. First, they have to check their plan's eligibility, which can be performed through Apple's online store. 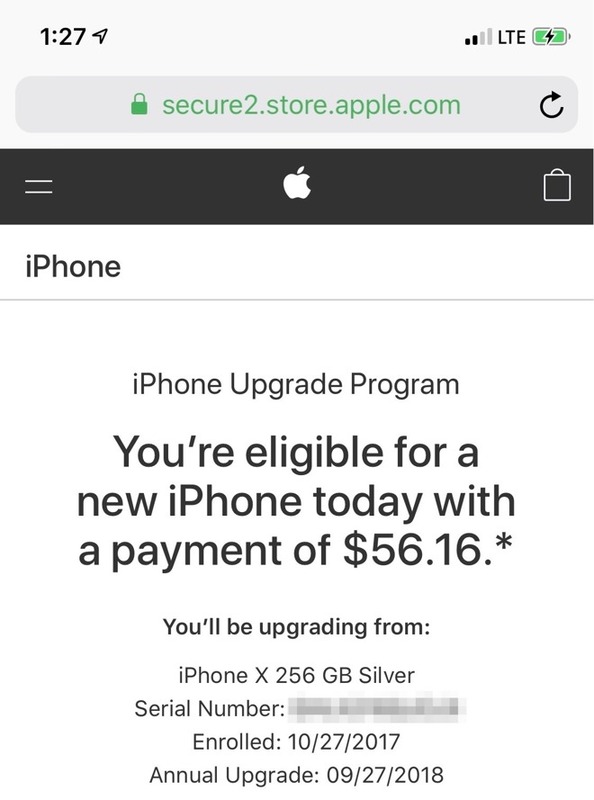 This requires either signing in with an Apple ID connected to the subscription, or by supplying the existing iPhone's serial number and IMEI. At present, the full 12 months of payments must be made in full fulfilling the terms of the contract, before an upgrade is made. For example, if ten payments have been made since signing up for the program, and an upgrade is requested now, the customer would have to make the equivalent of two monthly payments to bring the total to 12. The iPhone 8 and iPhone 8 Plus shipped on September 22, while shipments for the iPhone X started from November 3. Customers will need to weigh up the cost of paying to upgrade earlier, if the fee applies, and whether it is worth it compared to waiting a few months to do it cheaper. Another wrinkle in the scheme is that those who signed up for the iPhone Upgrade Program in the last few months will not be able to upgrade at the time of release. Under the program, customers must have been subscribed for six months before being able to upgrade. After confirming eligibility, customers looking to upgrade can either select the iPhone model they want from the online store, or conduct the upgrade at an Apple Store. At the time, customers will need to hand over details of their current wireless account, and other information relevant to the upgrade. In the United States, customers will be asked to provide their Social Security number and date of birth for a credit check, as well as a valid U.S. credit card. For in-store sign-ups, two forms of ID are required, with the first and last names of the individual needing to match on both documents. For online or Apple Store app orders, the new iPhone is delivered to the customer's door, along with a Trade-in Kit to send the existing iPhone back to Apple. The iPhone is taken in as a trade-in on the same day as picking up the new model, when the process is performed in-store. In either scenario, Apple advises that users should back up their data, and ideally to wipe any data from the iPhone before handing it in. 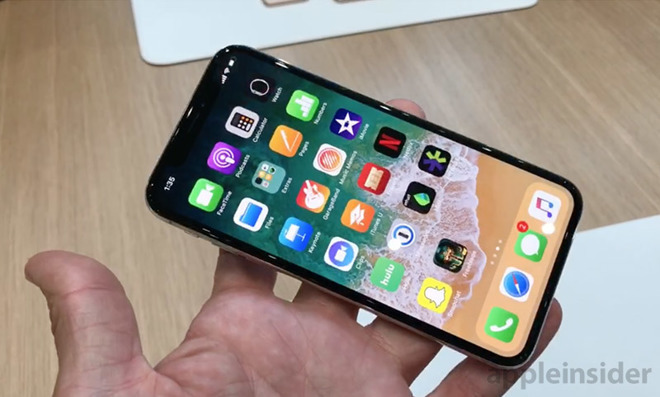 For the 2017 iPhone refresh, Apple offered a loan pre-approval process for the iPhone X and for the iPhone 8 pre-orders before they were released, providing a way to perform all of the necessary checks ahead of time, in order to allow program participants a chance at getting a launch day handset. It is expected that Apple will offer a similar process for this year's releases, so it is advised to keep watch for a notification on AppleInsider just in case the option is made available again. 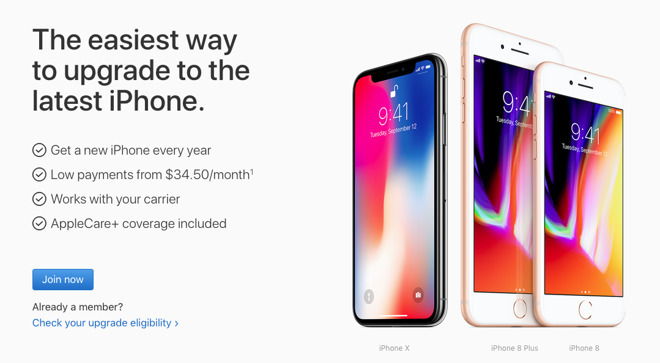 Launched in 2015 during Apple's annual iPhone event, the iPhone Upgrade Program provides a way for customers to get a new iPhone every year, in exchange for a set monthly fee. The first-party service offers many users who want the latest iPhone releases the chance to do just that, rather than be limited to the existing plans offered by carriers that could prevent a more timely upgrade. While customers have been able to sign up through AT&T, Sprint, and Verizon for some time, it wasn't until August that T-Mobile customers were able to enroll into the program. The monthly cost of the program varies depending on the model and capacity of the iPhone. 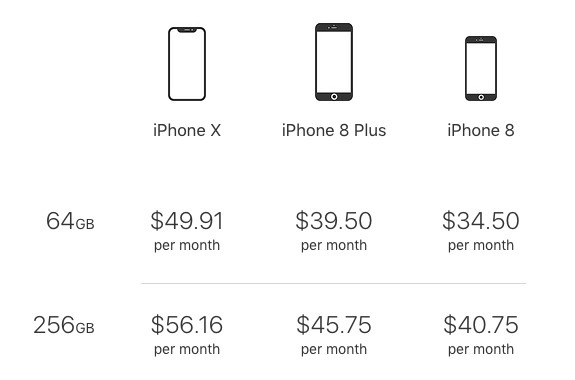 For example, a 64-gigabyte iPhone 8 costs $34.00 per month, but a 256-gigabyte iPhone X costs $56.16 per month. For their monthly subscription, the customer receives their selected iPhone and AppleCare+ coverage, with zero percent interest on the cost of the package when spread over 24 months. Once a user has made it to 12 payments, they can freely upgrade their iPhone to a newer model.